Unchain the Church. The program that Benedict XVI reinforced in Germany. Egypt, toward a new Exodus? Will the prayer save the spirit of Assisi? What is the difference a day can make? Right after September, 11 this single question – issued for the first times during the Seventies in a song by Esther Phillips – had been made hundreds, thousands and millions of times. Was what happened in New York in September, 11 really able to change the history of the world? Was September, 11 a true break in the history? The question is to make once more looking forward to the next meeting among religions in Assisi. Joseph Ratzinger did not take part to the first meeting, in 1986. He did not share the way the meeting had been organized, with the risk that one could see all religions mixed in one only vague new-age-oriented religion. «We went in pilgrimage to Assisi – John Paul II said – because we are all convinced that the various religions can and must give their contribution to peace». Twice more – in 1994 and in 2002 – John Paul II called the religions in one day of prayer, reflection and abstinence for the peace. The first one was aimed to pray for the peace in the Balkans, the second one was called right after the Twin Towers collapse, at the beginning of the new millennium. Benedict XVI is now preparing to his own pilgrimage to Assisi, the next October, 27th. The world has changed since 1986, since 1994 and even since 2002. Even the way to look at the meeting has changed, and this is fair when you read the theme of the meeting: «Pilgrims of truth, pilgrims of peace». There is much of the Ratzinger’s thought in this theme: one cannot make less of the truth in order to give a true contribution to peace. The authentic research for the Truth is the key of the dialogue among faithful of different religions – according to Ratinger’s thought – and the research for the Truth bring to mind the image of the Light, a common symbol for many religious traditions. Several times, Benedict XVI reasserted that the «need that all men believing in God look together for peace, try to get close the one to the others, in order to go together – notwithstanding the variety of their images of God – to the source of the light. This is the interreligious dialogue». When the Pope announced that he would go to Assisi to celebrate the 25th anniversary of the first meeting of the world religious leaders, quite everybody was surprised. Ratzinger – the one who wrote the Dominus Jesus that confirmed the unicity and salvific universality of Jesus – had been considered by everybody the gravedigger of the Spirit of Assisi. Yet, the Pope decided to go. And he gave his personal imprint to the meeting of Assisi. In fact, the meeting of the 27th of October has not been included among the liturgical events of the Vatican schedule of October. It is the gateway Benedict XVI indicated during his last trip to Germany, during the meeting with Jews, Muslims, Lutherans – interreligious and ecumenical meetings that always enrich the Benedict XVI’s visits to a foreign country. The communion among religions can be reached through two ways: the action of the reason on the faith, from a cultural point of view, and the prayer. Each religion should maintain his peculiarity, since religious beliefs presupposes truth. 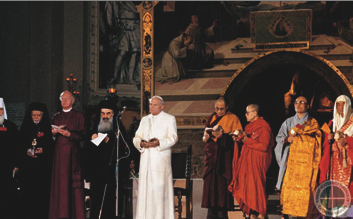 On the twentieth anniversary (September 2, 2006) of John Paul II’s Inter-religious Prayer Meeting for Peace in Assisi, Benedict XVI addressed a letter to the local bishop of Assisi commemorating the prayer initiative. The letter makes an interesting read. The idea of members of different religions praying together is not forgotten. Rightly stated, it is a good idea. But what is the right statement? Benedict recalls that the most significant event of the past twenty years is «the fall of the Communist-inspired regimes in Eastern Europe». Benedict XVI does note that the division into two opposing political blocks preparing for war did cease. Now world relations could develop under a «common international law inspired by respect for the needs of truth, justice and solidarity». The logic of this hope was that Communism’s proving itself unworkable left the world open to a revival of a peaceful world on classic human principles. But it did not happen. «The third millennium opened with scenes of terrorism and violence that show no signs of abating». The Pope next acknowledges that we may think «religious differences are causes of instability or threats to the prospect of peace». Certainly, in light of the religious persuasions of most terrorists, reasons to think this abound. In this light, Benedict remarks that John Paul’s initiative for prayer now seems like «prophecy» The implication seems to be that while it was rather difficult to pray with «atheists» it is possible to pray with Muslims. The Pope is most concerned that religion’s potential contribution to peace is now being questioned. John Paul II wanted to show «with no possibility of confusion that religion must be a herald of peace». It cannot be rationally held that no actual religions have justified the use of violence to achieve their ends. Benedict himself refers to this issue in his Regensburg Lecture. What seems to be meant is rather that when a religion appears to justify arbitrary violence, it must be rejected as a false religion. Only true religions are heralds of peace. This is a deft but delicate explanation. The dialogue among religions needs to be pushed up. After September, 11th, stats (as a Jonathan Fox research does) document that religious conflicts in the world have become in 2002 more common than non religious conflict. On the other hand, rarely religion is the only cause of conflict, and very rarely it is the primary cause of the conflict. For example, the Islamic fundamentalist movements’ riots are never rooted in religion, but they come from secular problems. Many of these riots are acted in authoritarian countries, where the freedom of expression in policy is limited and the opportunity to purposely take part to the political decisions is also more limited. Religious institutions are often the only possible way to create alternative élites. Another data should be food for thought: the discriminations against religious minorities are more frequent than the discriminations against other kind of minorities. Until a few years ago, religions had scarce consideration in the concert of the nations. For decades before September 11, policy makers and analysts in Western countries exhibited a sort «secular myopia» about religion in politics. Since faith was supposed to be private, they mostly left it out of their analyses. This happened despite the fact that ultra-conservative religious movements had appeared in many world faiths in those years and were often reflected in political action. When Henry Kissinger published «Diplomacy», his study of international relations, in 1994, it had no index entries for Islam or religion. Ten years later, another US secretary of state, Madeleine Albright, wrote her own study on world affairs: «The Mighty and the Almighty: Reflections on America, God and World Affairs». Almost half the book dealt with Muslims and Islam. The contrast between the two books highlights the way the world changed after 19 Muslims flew hijacked planes into the World Trade Centre, the Pentagon and a Pennsylvania field on September 11, 2001. The attacks brought religion back into public affairs for many Western countries where faith had largely faded into the private sphere. «9/11 showed religion can no longer be ignored – Scott Appleby, a historian at the University of Notre Dame, Indiana, told a seminar on religion after September 11 at Cambridge University – It is a critical element in many national systems and in radical and extremist movements, and also in movements oriented to human rights, peace-building and civil society». Since that day, governments and researchers in North America and Europe have turned to sociology, psychology, anthropology and other disciplines trying to understand religiously motivated violence and work out how to prevent it. Iran staged an Islamic revolution and Afghans waged jihad against the Soviet Union. Jews settled in Palestinian territories, the US Christian right emerged and Indian Hindus and Buddhist Sri Lankans went into nationalist politics. Harvard professor Samuel Huntington was one of the few to grasp this trend. His 1996 book The Clash of Civilisations saw religions and cultures at the root of post-Cold War conflict. The West and Islamic worlds were bound to clash, he argued. 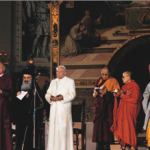 Ten years after the September, 11th, twenty five years after the first meeting in Assisi, there is still the need that religions gather together and find an effective answer for the pace. «Many of us – Olav Fikse Veit, general secretary of the World Council of Churches, said –remain convinced that nonviolence can be the most helpful long-term response to violence and the most effective means toward a lasting peace based on justice». It is the first time the Community of Sant’Egidio has not been involved in the organization of the event. The «organizers» are the Vatican Secretariat of State, the Congregation for the Doctrine of the Faith, the Pontifical Council for the Culture, the Pontifical Council for interreligious Dialogue, the Pontifical Council for Justice and Peace. Ecclesiastical movement had been involved for some “marginal” detail and to gather the volunteers. There still no information about how the meeting will be carried out. The most important moment of the day will surely be the pilgrimage to Saint Francis’ tomb in Assisi. The prayer will be important as well, and the speeches will for sure be about the role and responsabilities of religions in promoting peace. There will not be a liturgy. But there will be a unity based on the research of God. Turning back to God to find the Spirit of Assisi again. This is the Benedict XVI’s plan.